Ignoring tradition, Tel Aviv City Council approves proposal for public transportation on Shabbat, Transportation Min. nixes it. Members of the Tel Aviv City Council - the first Jewish city built by Zionists - approved on Monday a proposal to operate public transportation on Shabbat, Channel 10 News reported. The proposal was passed by a vote of 13 supporters against seven opponents. The proposal, which was presented by the Meretz party’s representative in city council, was supported by Mayor Ron Huldai. The proposal calls on the Tel Aviv municipality to request approval from the Commissioner of Public Transportation in the Ministry of Transportation to run buses during Shabbat. City Administration is to prepare a plan that will be submitted for approval. The Commissioner of Public Transportation is authorized by law to approve such requests in cases where they are deemed necessary, or in cases where the public transportation serves non-Jewish populations or there is a need to use public transportation for the purpose of arriving at a hospital during the Sabbath. 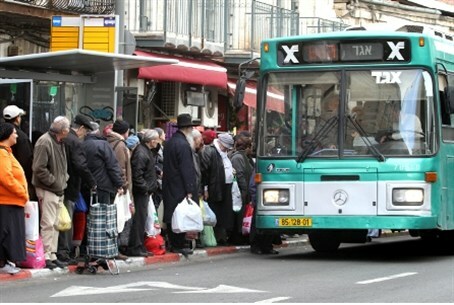 However, Channel 10 reported, the Ministry of Transportation has already stated that the use of public transportation on Shabbat was permitted only in certain cities and there it has no intention of changing the status quo in the case of Tel Aviv. Tami Zandberg, the Meretz party’s representative in the Tel Aviv City Council, was unfazed by the Ministry’s comments and urged for the implementation of the move. She added that the status quo must match the current reality. “You cannot continue to live under an order dated more than 60 years ago,” she said. The Shas party’s representative in the Tel Aviv City Council, Binyamin Babayof, criticized the move and told Arutz Sheva that it is outrageous. Babayof spoke to Arutz Sheva before the vote and before the proposal was approved. He added that most of Tel Aviv’s citizens, secular or religious, want Shabbat to have a Jewish character to it, and that means no buses.